My dad grew up in Michigan’s Upper Peninsula where many people are of English ancestry and are in love with the traditional pasties recipes. The pasty is such a savvy comfort food that many hunters and miners eat them as a quick and convenient lunch. In one dish you nourish yourself with all three important macronutrients to fuel your metabolism. Every summer when I head back to the Upper Peninsula for our annual summer vacation on the lake, our family will not miss this family tradition. 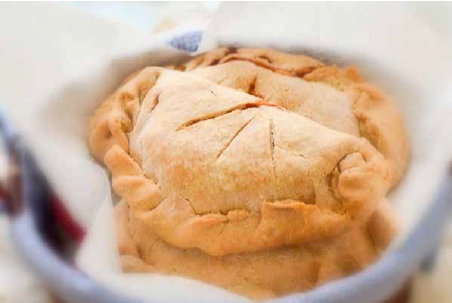 What would be better than savoring a pasty while being nostalgic recounting family memories? Make this dish even more delicious by dipping each bite in ketchup or I reach for mustard with less sugar! In a large bowl, stir margarine and water until margarine is melted. Gradually stir in flour and salt until a very soft dough is formed. Cover and refrigerate for 1- ½ hours. On a floured surface, roll out one portion at a time into a 10-inch circle. Mount about 2 cups filling on half of each circle; dot with 1 tsp margarine. Moisten edges with water. Fold dough over filling and press edges with a fork to seal. Place on ungreased baking sheets. Cut several sifts in top of pasties. Brush with cream if desired. THE BIG PICTURE: How having a big, risky vision can move mountains.